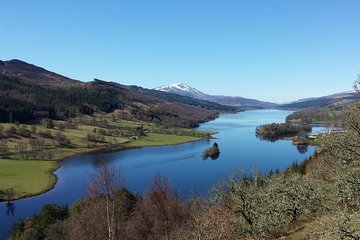 Utforska sevärdheterna i det skotska höglandet - från konstgjorda landmärken som Blair Castle till naturattraktioner som lochs och vattenfall - på denna dagsutflykt från Edinburgh. Du kommer att besöka Queen's View för foto ops; ta en kort flodpromenad vid The Hermitage; stanna vid ett slagfält beundra berg och höglandskor; lära sig om lokal historia; och mer. Denna gruppresa är begränsad till 16 personer för att ge en mer personlig upplevelse med en guide. This was a most enjoyable tour. Apart from getting out of Edinburgh, which was very crowded due to the Tattoo and Festival being run concurrently, the journey through the Scottish countryside was a very pleasant and relaxing experience. Our guide, Niall, was extremely knowledgeable about all aspects of Scottish history, culture, geography and life style. He recounted his knowledge in a most entertaining style and kept us amused with his stories of early life in Scotland. The visit to Blair Castle was most enlightening and well worth the effort. They cancelled the battlefield, we didn’t get to see a hairy cow and the places we visited were just ok. Our guide was good though, not a reflection on him. Angela, our tour guide was simply amazing. She was fun, kind, friendly and was full of information. Loch Lomond seen at Luss village. The weather was too windy for the boat ride. Aberfoyle across the way. Blair Castle, the grounds were impressive. There was an old church ruin that was charming. Horses, hairy coos and even a peacock. But my favorite stop was the last, the Hermitage. It's actually little more than a walking path alongside a whitewater stream. The nature there was mystical. Also thanks to out driver/guide Donald whose expertise and courtesy made this a truly grand day. Tour guide felt the need to fill all the time with commentary, often was repetitive, didn't preview the day, so it wasn't clear how much time we would have at each stop. Really wasn't adequate time at any stop for a decent lunch. Last stop involved a bit of a walked, but guide didn't let us know how far, whether shoes were appropriate or give us the options of not going. I almost missed this bus, in fact I am pretty sure I did miss my bus which was scheduled to go to Loch Ness and Invernes so given that I was a bit astonished when the driver took the opposite fork in the road from invernes. Be that as it may, the trip was so educational and our driver made it so fun. Not only did I learn alot of history about all the sites we did visit, castles and ancient catherdrals included, but she even had a road trip play list for us and explained the Galic words, wow, authentic and wonderful. She was so good that when we saw the most unusual rainbow just on the mists of a loch, she turned around and let us all out to take pictures. For those who are disabled, all the walking is pretty easy but for arthritus sufferers there is some up and down which can be painful. But all options have alternatives, more flat paths, a video in Blair Castle so one won't have to do the stairs. They really did think of everything. This was a fabulous tour. This was a highlight for our family two adults, two kids ages 12 and 14. Our guide, Iain, was funny, knowledgeable, and clearly passionate about history and his country. He gave us great insight into the geography and history of what we saw, and allowed for plenty of time at each stop. Our only regret was that the tour wasn't longer, we could have gone on! The driver/tour guide was knowledgable, witty and solicitous to the groups' needs and comfort. This was a great day out and a wonderful way to gain an insight into Scotland and its' history. Tour left on time, bus was clean and comfortable. I felt very safe with the driver and his driving abilities. Amazing day out with our guide. She was very friendly, chatty , full of knowledge and amazing energy. For sure I will.be coming back when do other guides with their company. Thank you for a great day out.